Meet Dottie (Doing Other Technology That Is Extensible) my BoeDuinoBot.Net Robot built on a Parallax Boe-Bot (parts kit) with a netduinoPlus (a netduino is in the mail somewhere…) rather than a basic stamp. Note the Parallax Li-ion Power Pack Mounted under my BoeDuinoBot.Net RCB (Robot Controller Board). 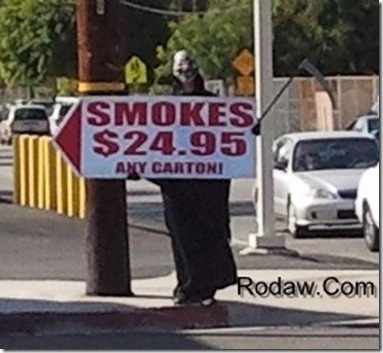 I was heading out to the Post office this November 3, 2011 when I came across a fairly funny scene. To me at least. 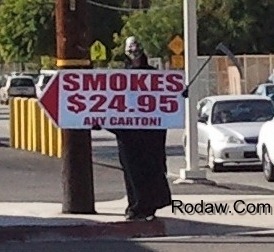 It’s the Grim Reaper selling Cigarettes on a street corner. Advertising Fail! Might do better as a public service announcement. You know, one of those folks, and this one truly nameless, advertising with a flip sign.